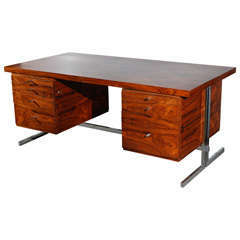 1950s Danish rosewood veneered 6-drawer desk with shaped legs. Michel Cadestin and Georges Laurent office suite from the administrative offices at the centre Georges Pompidou by Teda, France. 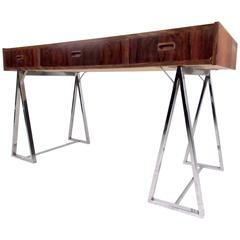 Pierre Paulin desk with Macassar veneered and leather top. 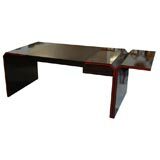 Seven sides with red lacquer stripe detail. 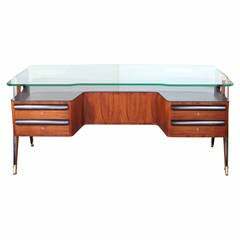 Midcentury rosewood desk by Paolo Buffa with glass top and brass sabots. 1960s Danish desk by Kai Kristiansen. 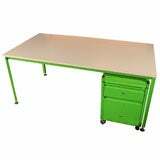 Features three drawers on either side of desk, as well as open storage on backside. 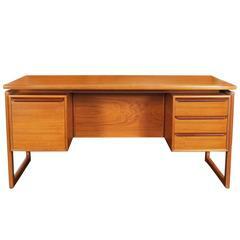 Danish modern teak desk, features three drawers on the right side and one file cabinet on the left side. A rear storage space for display. Lovely little Danish midcentury teak desk, with three drawers, one shelf on the side and one on the back.